How did katakana and hiragana originate? Next: Is there a kana symbol for ye or yi? Both hiragana and katakana are simplified forms of kanji (Chinese characters). Japan had no writing system before Chinese characters were introduced in the first or second century AD. Initially the Japanese tried to write Chinese, but since Chinese and Japanese are unrelated languages, they also used kanji to represent Japanese sounds. Hiragana and katakana were simplifications of this system of writing. The hiragana are based on entire characters written in a style of Chinese calligraphy called sōsho (草書) where each Chinese character is written with a few continuous brush strokes. See Handwritten styles for more about this calligraphy. Hiragana emerged around the ninth century, initially as a form of simplified writing used for informal correspondance. 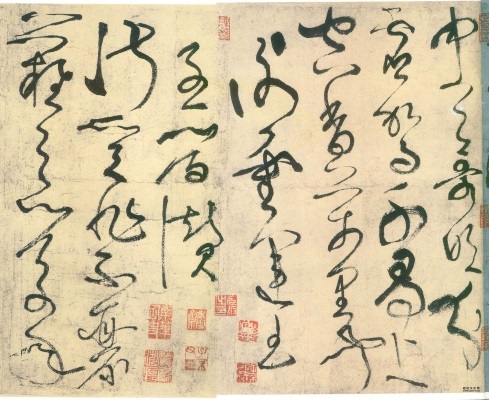 Sōsho or cursive calligraphy by Zhang Xu, a Chinese calligrapher. 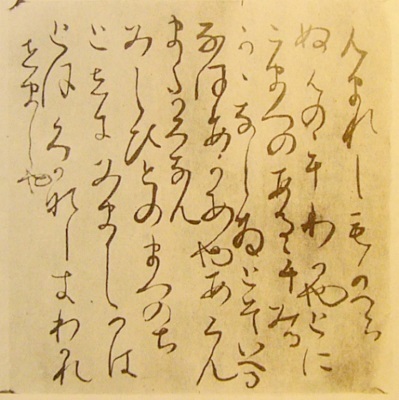 An early example of hiragana by Fujiwara no Teika (1162-1241). The katakana are based on parts of kanji. They developed from kunten (訓点), a way of annotating Chinese texts so that the Japanese could read them. The earliest examples of kunten date from the end of the eighth century, and the earliest records of katakana being used as an independent form of writing date to around 951 AD. Below are two tables of the parent kanji of each hiragana and katakana. There is uncertainty about some of the characters, resulting in discrepancies between sources. In the tables, where several possible explanations exist, they are shown separated with a slash, "/", as in 毛/无 for hiragana ん. The katakana predate the existence of the syllabic nasal sound represented by ん (See What is syllabic n?). This sound came into being around the year 1,000 AD, after the katakana had already been created, and so originally there was no equivalent katakana. According to Seeley's book on the Japanese writing system, katakana n (ン) did not originate from any particular kanji. However, other sources state that it originates from the kanji 尓/爾 (these are both forms of the same kanji). The origin of the katakana character ツ for tsu is also unknown, since it appears fully formed in the earliest documents available. In the past, hiragana took more than one form for each "sound". Since 1900, they have been standardized to unique forms, and the variant forms only live on as hentaigana (変体仮名). These are rarely used in text, but are used sometimes on signs, particularly for soba restaurants such as in the illustration, where the word "soba" is written using hentaigana. See What is hentaigana? for more about these characters. The writing system using Chinese characters to represent Japanese sounds is known as man'yōgana (万葉仮名), "kana from the Man'yōshū (万葉集)", a collection of poems. See What is man'yōgana? for details. Thanks to Jim Breen and Kouji Ueshiba for more information. The photo of Zhang Xu's calligraphy is from Flickr user 阿坤 Wang kun hung, used under a Creative Commons licence. The photo of Fujiwara no Teika's calligraphy is from Wikipedia Commons user ReijiYamashina, used under a Creative Commons licence.